A lot has been made over the last week or so, over not only the way theater projectionists display the movies you pay to watch, but the way in which the filmmakers who make those movies communicate with theaters. We’ve seen the letter Michael Bay sent to projectionists with Transformers: Dark of the Moon, urging theater owners to display his movie as brightly as necessary. We’ve heard rumors that Pixar even goes so far as to bribe projectionists with free stuff, to get them to care enough about their movies to do their job. But all of that’s nothing, compared to this. Let’s consider this the final word on how much filmmakers care about the job theater projectionists do with their movies. The following is a letter from Stanley Kubrick, sent to theaters with prints of Barry Lyndon in 1975. 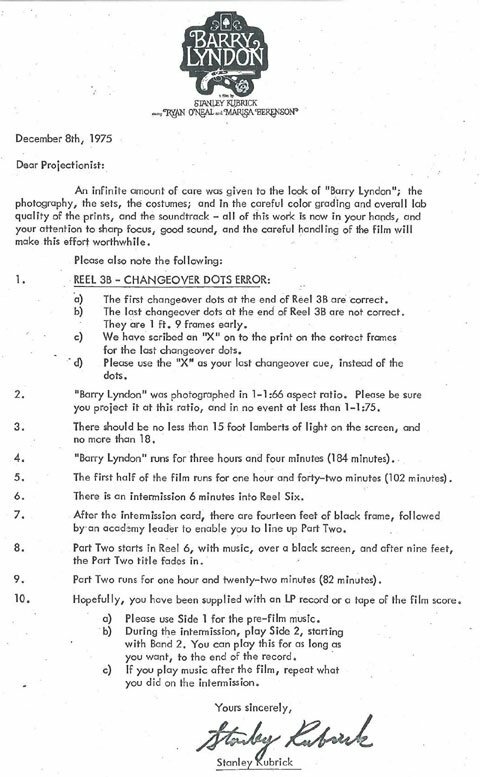 As posted on Reddit, the message not only stresses just how much work went into the film, in imploring projectionists to show it properly, but goes so far as to flat out tell them exactly how to do their job. Kubrick knew what was up. Something tells me he wouldn’t have stood for this 3D stuff, let alone the tendency of theater owners to project 3D movies improperly, in order to save a buck.